The Greatest Common Divisor (GCD) is also known as the Highest Common Factor (HCF), or Highest Common Divisor (HCD), or Greatest Common Factor (GCF), or Greatest Common Measure (GCM). In this article we will show you, How to write a Java Program to find GCD of Two Numbers using For Loop, While Loop, and recursive method. According to Mathematics, GCD of two or more integers is the largest positive integer that divides the given integer without any remainder. For example, Java GCD of 8 and 12 is 4 because, both 8 and 12 are divisible by 1, 2, and 4. The largest positive integer among the factors 1, 2, and 4 is 4. NOTE: In order to find the Greatest Common Divisor or GCD in Java, we have to pass at least one non-zero value. This program for gcd of two numbers in java allows the user to enter two positive integer values. Next, it will calculate the Highest Common Factor (HCF) or GCD of those two values using For Loop. In this gcd of two numbers program we are using the While Loop and a temporary variable to calculate the GCD. This Java program to find gcd of two numbers calculate the Greatest Common Measure without using any Temporary variable. 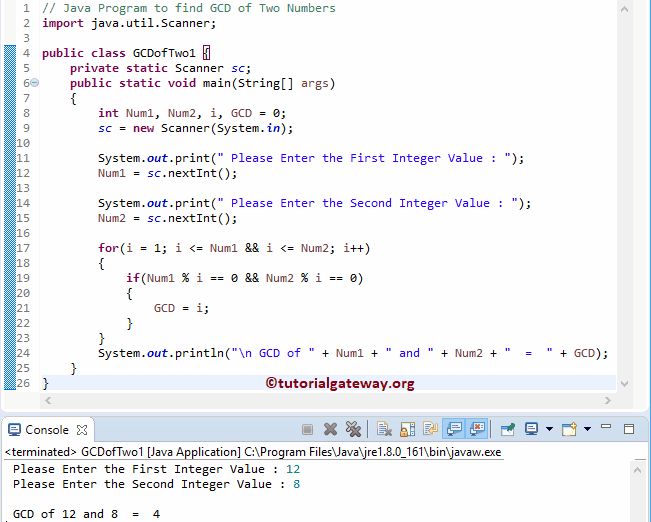 This Java program to find gcd of two numbers is same as above example. However, this time we separated the logic, and placed it in a separate method. This helps you to debug the code very effectively. This Java program to find gcd of two numbers will calculate the Greatest Common Divisor by calling HCFofTwo function recursively. I mean, recursive function calling.